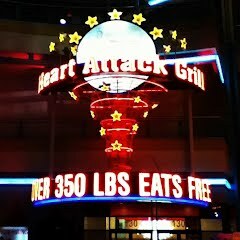 If you are Over 350 Pounds — you eat FREE at the Heart Attack Grill! Any Takers? Any Takers?? Since I’m doing this Food DeTox — maybe I’m overly sensitive and attuned to this topic right now. There’s alot of chatter in the news, especially on CNN where Dr Sanjay Gupta seems to be having his own heart attack (of sorts) over this restaurant in Las Vega called the Heart Attack Grill. Don’t get me wrong — this place is a wreck. A human deadly mouse trap. Oh, the relentless metal trap might not catch your head the first time you sneak some cheese from THIS grill, but…..no two ways about it — keep sneaking into this place — and it’ll get ya. It’ll get all of us. Hell, their spokesman, a relatively healthy 185 pound man in the prime of his llfe….just dropped dead of a heart attack. SNAP! The trap got him. The proprietor of this joint is hilarious. Oh, he’s dressed like a Doctor, stethoscope and all. And he calls his patrons “patients”, and offers them hospital gowns to wear over their street clothes. As they eat. themselves. to. death. Sounds hysterical. <sarcasm> . Oh he’s very O.V.E.R.T. about what his place IS. And for good reason. His food is the worst-of-the-worst. If you can make it past the 6-inch thick sarcasm of his website — the menu includes burgers called the Quadruple ByPass….and Flatliner fries that are fried in a pile of lard. Yea. The thick, shiny, yellow, greasy artery-clogging kind. He just piles it on your fries, so they soak in the stuff. Just gross. After this place, maybe McDonald’s qualifies as a healthy choice??? Hmmm, maybe. Not. So, if you are not advertising the place Diane, what’s your point? Well — here it is. I’m not particularly offended by the dude who runs this heart attack restaurant. In my view — he’s doing us a favor. He’s telling us (without saying it), before we ever walk into the place —- “this food I am serving you — will KILL you. eventually.” Public Service Announcement Complete. It couldn’t be more clear. ‘Nuff said. IMHO. This doesn’t bother me a bit. Not one bit. You wanna know what does bother me? The fact that you can walk into Nathan’s or Cheesecake Factory or PF Changs or Ruby Tuesday — and get food that is equally bad for you —- however there — there ain’t no sign! But, IMHO, there should be. Those places have food on their menus that ALSO should be stamped Heart Attack Grill. And I’m not picking on just these restaurants. There are plenty of others just like them. But these happen to have some menu items that have become notorious with us Weight Watchers. So – you all know that on Weight Watchers, they simplify the act of eating, by assigning each Watcher a set number of Points Plus Values (PPVs) to eat every day. And then they sell us (LOL, yea) a calculator to help us calculate PPVs using Fat, Carbs, Fiber and Protein in each food. I’m 47 years old, and weigh 199.4 pounds, and am 5’6″ tall. So, I’m assigned 28 PPVs each and every day. And I’m supposed to manage to eat breakfast, lunch, and dinner, plus a couple of healthy snacks with that daily allowance. And — when I’m home or away, and cooking or shopping smart — it’s completely 100% possible. And enjoyable! Which is even more important to me – in the long run. B.U.T…..when/if I go out to eat….at say, a restaurant establishment…..well. Things…Get….A…..Little…..Tricky-er! Come, let’s check it out. So….. let’s say we go to Ruby Tuesdays — which was a pretty typical “eating out” choice for our family BWW (before Weight Watchers). Let’s look at what happens to our PPVs when we make some choices off the Ruby Tuesday menu. Lets say you were in the mood for a burger —- like their Fresh Handcrafted Burgers Bacon Cheesburger. That sweet choice will cost me 28 ppvs. Um, Yup. Don’t check your batteries, your calculator IS working. That my dear, is my entire day. Geez, I h.o.p.e. that is One D@mn BIG Burger. So I can take some home. For later. I’ve still got the whole day ahead of me, ya know! Ok well, Diane, that’s not fair — burgers are a BAD choice. Everybody knows that. Why not choose a salad or a chicken pasta dish??? Ahhh, yea – ok. Yes. Let’s make a better choice! Right. Let’s Do That! How about Pasta? Like their Pasta Classics Lobster Carbonara – 38ppvs; or their Classic Parmesan Chicken Pasta – 38ppvs — or better still, let’s choose the healthiest protein of all — shrimp! If we pick their Classics Parmesan Shrimp Pasta – well THAT’s just …um…32 ppv. What? No go getting all emotional now. Just the facts ma’am. Just the facts. Oh, and that salad….the ultimate “Good choice” , right?? — well, the Ruby Tuesday Fit & Trim Grilled Chicken Salad – will only cost me 14 ppv. 14. That’s HALF my entire day’s allotment ….. on a salad. With plain ole grilled chicken in it. AND — they have the nerve to label this thing “Fit & Trim”. Holy Smokes! Got your attention?? Yea, so you see. At the Heart Attack Grill — they are labeling their food for exactly what it is. A BAD choice. A Heart Attack Waiting to Happen. However, when I stroll into Ruby Tuesday, and sit down, and order a Fit & Trim Grilled Chicken Salad — no where, NO WHERE in my realm of consciousness, am I made aware — that I am about to eat rabbit food that constitutes 50% of the food I should be eating that entire day. Where’s the label now? Doctor? Doctor? Ahhh, see. No labels. All this is secret. Hidden in the nutritional information that is buried so deep on these restaurant web sites — that you can’t even click to it from the front page in most cases. No, you have to be vigilant and google, and hunt and search. So you can KNOW — if the next bite you take at Cheesecake Factory or Nathans is a Heart Attack item. Ohhhh, you don’t think it’s possible? Well — check out this little factoid. If you choose the Cheesecake Factory for your meal choice — KNOW this. A Chopped Factory Salad or the Skinnylicious Turkey & Avocado Sandwich will cost you 13 PPVs each. Just I.M.A.G.I.N.E. the PPVs of the other more cheesy, more greasy, more deep fried, less disciplined choices. Just I.M.A.G.I.N.E. Oh…and you can’t leave without having a slice of the signature cheesecake, right? I mean…..it’s what the place is named after — after all! One slice of the Oreo Cookie Cheesecake is also 13 ppv. And just because I KNOW you are wondering…..NO, it is NOT an anomaly. All the cheesecake are about that or worse! So — in one meal — a salad or a sandwich and a piece of cheesecake — you my dear have eaten almost ALL of your daily allotment of food. I don’t know about you..but I’m S.T.U.F.F.E.D! So in closing — I say — BRAVO Heart Attack Grill — BRAVO for being open and honest and TRUTHFUL about what your food is. And fellow eaters out there —- if you can’t manage to stay out of that place — I’d suggest you take some of the money you are saving by eating free at the Heart Attack Grill and find a good psychiatrist! What I wanna know is this — WHEN will I be able to go out to eat, and see the label “Healthy”, “Skinnylicious”, or other deceptively used terms — and be able to trust that the choice will NOT take half of my daily food intake to consume. Just because it’s 50% less fat than the CRAZY GROSS FULL FAT version you used to serve me…..does NOT make it Skinnylicious. Not in my book anyway. Ohhhh and Nathan’s…..I think YOU are also a heart attack grill, (allegedly). The fact that you have the nerve to sell an item called your Famous Seafood Shrimp Boat —- all 99 ppvs of it —– Is INSANE! Heart Attack…..served up nice and warm right there in your neighborhood mall! You don’t need to go to Vegas…to find it. Sadly. loved this one!!! it’s a scary world out there.